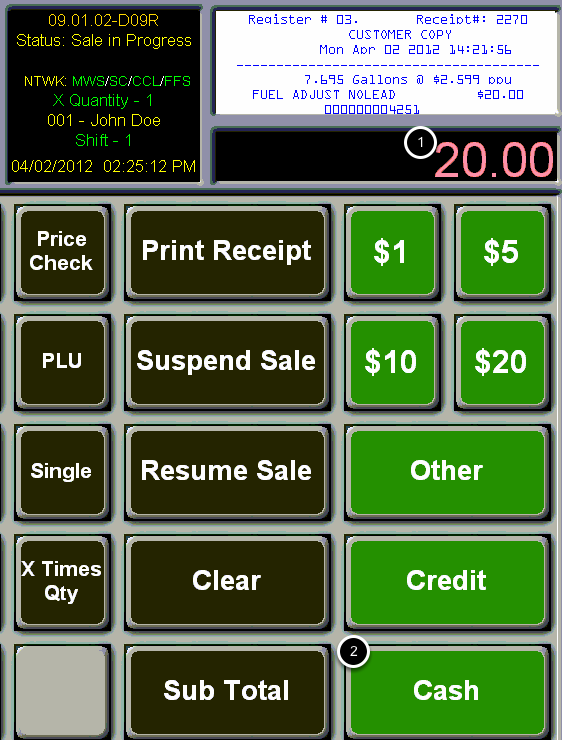 TravStar1 Point Of Sale SystemRegister Manual Gas TransactionsHow Can I Create a Fuel Transaction Manually? How Can I Create a Fuel Transaction Manually? This lesson will teach you how to create a fuel transaction for a specific amount without actually dispensing fuel. From the dispenser screen, touch the "Fuel Adjust" button. This will take you to the screen where the Fuel Adjust buttons are located. Type the dollar amount of the fuel transaction using the number pad on the keyboard. In this example, the transaction is for 20 dollars. Touch the "Fuel Adjust" button for the appropriate fuel grade. In this example, we are creating a transaction for unleaded fuel so we will touch the "Fuel Adjust Unleaded" button. Your Fuel Adjust transaction is now a Sale in Progress and is ready to be tendered. Prev: How Do I Ring a Stacked Sale from a Dispenser? Next: How Can I Stop the Dispensers in Case of Emergency?